Podcasts are amazing for personal growth and learning from top professionals in their respective fields. However, there is an issue that sometimes arises for average climbers listening to pro climbers discuss their training plans and difficult sends. Oftentimes the work ethic and climbing history of professional athletes goes unsung -- don’t forget the road these individuals have traveled to reach the point that they are at now. Every pro climber that you hear on a podcast is obsessed with the sport, and I would bet that their first few years they spent 6 days every week in the gym for over 2 hours. This is a lot of climbing -- over a two year period that would be 624 sessions, or 1248 hours, spent in the climbing gym. This amount of time on the wall allows them to build strength, technique, and muscle memory to be used as the base for all the future years of climbing to come. Thus, professional athletes are able to train hard with regimes that would injure a normal climber who hasn’t built up such a good foundation. I have seen lots of climbers reach a plateau very early on in their climbing career, and they jump straight to hangboarding as their first solution. Usually this is a direct result of learning about a more experienced climber’s training program. In my opinion, this type of training will actually slow down your growth if started too early in your climbing career. Not only does it take time away from being on the wall, but it increases your chances for injury. Finger injuries are extremely common and easy to incur through repetitive strain, poor form, and overloading. The climbing / training split should be 80/20. 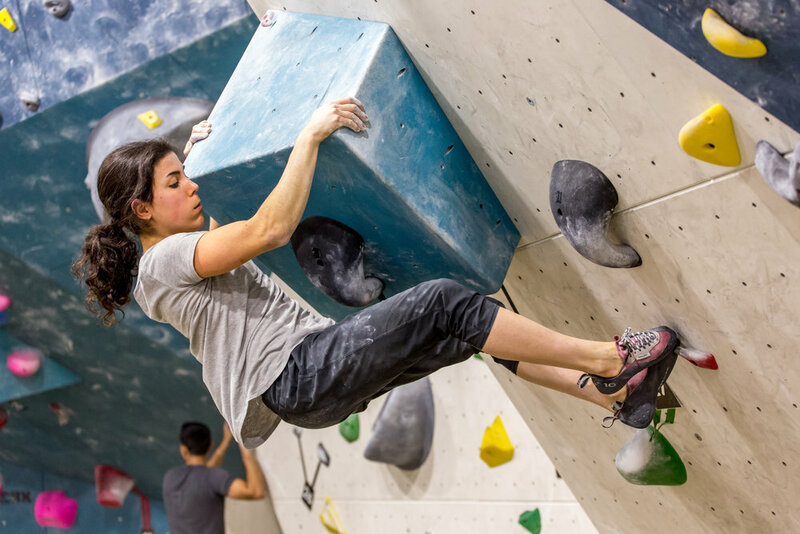 The best way for new climbers to get stronger is by just climbing, which is why you should be doing it at least 80% of the time. The remainder should be put towards antagonistic exercises, flexibility conditioning, and general strength training. What does “just climbing” actually mean? A true climbing session means trying hard, pushing your boundaries, and exploring new techniques on the wall. Climbing is a movement sport, so we should try our best to work on various body positions as much as possible. The act of just climbing will naturally build strength and allow you to build a better foundation in order to progress to harder grades. When you hear a pro climber talk about their training, let it inspire you to climb more. But don’t let it cloud your judgment and prioritize training over time on the wall. Heed some words of advice: If you want to be the best, training never stops. Climbing is training, so you can never stop climbing.